The structure of the cervical spine, subsists of 7 vertebrae, spanning from the skull to the thoracic spine. The bones, ligaments, tendons, and muscles of the neck function conjointly to support and balance the head as well as provide mobility. However, when a condition or trauma from an injury causes an abnormality or harm to the cervical spine, notable symptoms of pain and stiffness can develop. Neck pain is on occasion experienced by a majority of people although some causes for neck pain are more frequent than others. Cervical Radiculopathy is a term used to describe an array of symptoms rather than a single condition. Various conditions resulting with compression of one or several spinal nerve roots in the neck or injuries that may cause damage to the cervical spine can cause cervical radiculopathy. The symptoms include pain on the neck, tingling and numbness in the arms and hands, and muscle weakness but, as with any condition, the symptoms can vary for each individual. 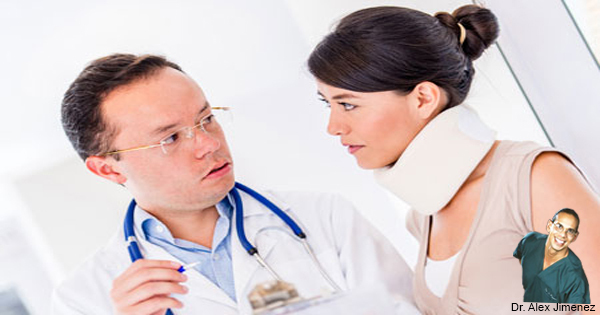 A cervical fracture, best recognized as a broken neck, is often identified when a single or multiple of the seven cervical vertebra suffer a fracture, break, or crack on the bone after experiencing an injury. Trauma due to an injury is common, especially among athletes, but if a cervical fracture is not treated properly, it could lead to pain and further complications. A broken neck can result in local swelling of the muscles, ultimately causing an impingement on the nerve roots and often leading to symptoms of cervical radiculopathy. The vertebrae of the cervical spine normally align on top of each other into a minor C-shaped curvature known as cervical lordosis. The curvature of the neck is designed to support the head and spine by balancing the body. In some cases, the vertebra in the neck are altered to the point where the cervical lordosis loses its natural curve and the neck becomes rectified. Diagnosing this condition can be challenging as symptoms may often not be present, but in severe cases, symptoms of pain, tingling and numbness can occur. Spasmodic torticollis is a medical condition characterized when the muscles surrounding the cervical spine contract involuntarily and cause the posture of the head to abnormally twist to its side or in some cases, tilt forward or backward. Torticollis causes pain and discomfort as the nerves of the cervical spine can become compressed also, the pain can radiate from the neck to the shoulders, followed by headaches. The symptoms of this condition have been known to progress gradually until they reach a point where they stabilize. Whiplash is medically defined as an injury diagnosed after the head jolted abruptly in an unexpected, back-and-forth movement in any direction, causing the soft tissue in the spine to stretch and strain, usually after an automobile accident. The ligaments and tendons are damaged by the sudden jerk of the head causing the familiar symptoms of neck pain and stiffness. The majority of cases of whiplash are considered mild, but this type of injury can limit mobility and lead to severe headaches depending on the level of the injury.